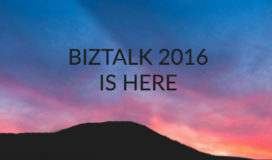 The BizTalk 2016 release has us pumped! This is the 10th major release from BizTalk, the enterprise-integration server that automates mission critical business processes. BizTalk 2016 bridges the digital transformation needs for on-premises automation while allowing the creation of applications in the cloud. Microsoft shared the integration future and roadmap late last year with detailed directions and key product offerings that address areas such as cloud, on-premises, B2B, connectors, and social network space. Businesses in the digital transformation age are growing rapidly and require increased agility and faster delivery. It has become essential to integrate mission critical applications as well as to connect seamlessly to modern SaaS applications. BizTalk 2016 will provide quick value for these integrations. Build your journey toward digital transformation to connect with your customers, partners, and enterprise systems enabling exceptional speed and agility to streamline your business operational needs.